Disclosure of criminal antecedents of candidates, which finally led to the candidate disclosure law in 2003. Improvement in voter registration after years of struggle and relentless pursuit. Political funding law in the wake of Tehelka scam. Limiting the size of the Cabinet. Local Courts law enacted in 2009. Autonomy of cooperatives through the 97th Constitutional amendment. Cancellation of 2G spectrum licenses, and competitive bidding of natural resource allocation. We founded Loksatta Party in 2006, as we sensed the need to create a platform for new politics, and to bring the youth, middle classes, and politically marginalized sections into the mainstream. Only when these classes yearn for new politics will change be accelerated. Once these disenfranchised classes become vocal and play a creative role, established parties will be forced to change their ways and improve our democracy. In most societies that is how change happens. But if these parties fail to respond to people’s urges, they will be eventually marginalized, and new political forces will replace them. 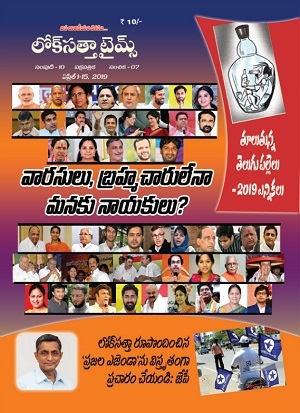 Given the plurality of India and the compulsions of its electoral system, Loksatta has always believed that if reasonable standards are met in terms of political behaviour, we should work with other parties to further a common agenda, viz, democratic reforms, public participation in politics and government, and improvements to quality of life and governance. In retrospect, we have witnessed significant change over the years. We have been an important influence in changing the attitude of our society toward politics and political participation. We have never treated politicians and parties as untouchables. We worked with parties and governments with dignity, openness and integrity, and on our terms. It is this engagement that is central to our successes in improving our democracy. In the last two decades, Indian politics has however become a spectator sport only during election time and it has moved far away from working for the nation and its people. Loksatta was formed with long term vision of political reforms towards nation building. We have seen that electoral politics have become an impediment in our journey to bring about a meaningful change. Loksatta has decided to rejuvenate itself as Loksatta 2.0, with the wisdom from the past two decades and a laser sharp focus back on its reform based agenda. 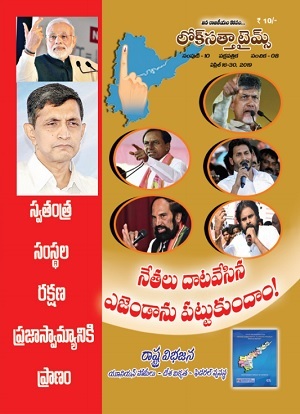 Loksatta will step away from the electoral politics until the conditions are conducive for Loksatta brand of politics. While we are away from elections, we will still continue to work for political transformation and build people movements to strengthen our democracy, said Dr Jayaprakash Narayan, Loksatta founder while addressing media in Hyderabad. We welcome all like-minded organisations, political parties and individuals to join hands as we take on this exciting journey to transform India - Dr JP said. Surendra Srivastava, National President, addressing media said that "I've had the privilege to associate with Loksatta for the past 15 years and the party since its inception. I am proud of the fact that we are able to completely change the perception about politics from the time we started and today, it is heartening to see many young men and women coming forward to enter politics and choose politics as the vehicle for change. Today's announcement should be seen as 'Loksatta going back to its roots - Loksatta is perhaps the only organization in our country that had phenomenal impact in political, administrative and judicial world; while we are happy about our accomplishments, we have a long way to go to realize the unfulfilled potential and eliminate avoidable suffering. We always believed political power is the means and not the end in itself. We will leverage our strengths and work hard to bring systemic changes that will have a lasting impact in the journey of our nation"
Sri N Srinivas, Lok Satta Telangana Convenor and Smt Hyma, LSP Gen Secy participated in the press meet.